Me and Aswin have been planning for this for quite some time and the following are the places we visited. 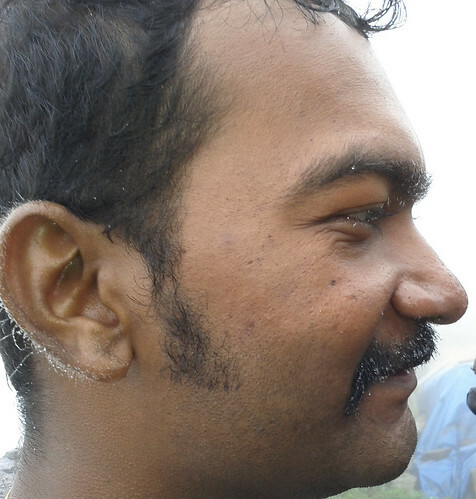 The initial plan was to start from Bangalore at around 5, so that we can reach Hassan in a decent time. We got delayed by rain and were able to start only at 7:30 PM and by the time we crossed Bangalore it was already 9. We had a quick dinner and started towards Hassan at around 9:45 PM and reached Hassan past midnight. After a few minutes of search, we found a decent hotel and went to sleep at around 1 AM. Thanks to Aswin’s alarm, we got up early in the morning and started at around 7 AM and reached Belur around 8 AM. We had a quick breakfast at Belur and started towards Chikmagalur. The road was awesome and we stopped in a couple of places for photo-shoots. From Chikmagalur, we went to Kemmannugundi through Mullayanagiri. Mullayanagiri is the highest peak in Karnataka. 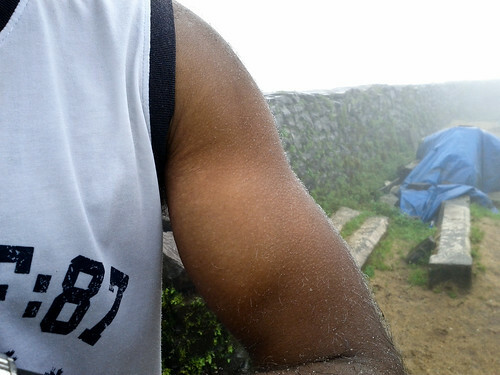 By the time we reached the top, it was drizzling and the place was completely covered with mist. 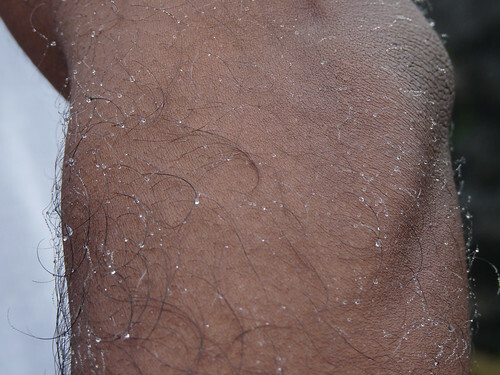 I was just wearing a sleeveless t-shirt while the others were all shivering 🙂 You could see the frost which deposited on me in these photos. The road was good until Mullayanagiri, but it was the last 20Km to Kemmannugundi. 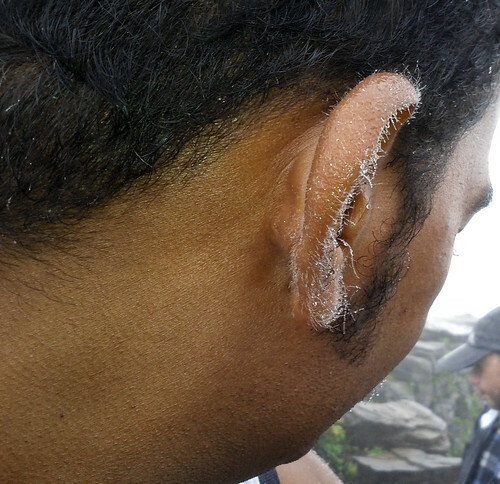 We reached Kemmannugundi at around 3 and had omelettes as late lunch in a road side shop. 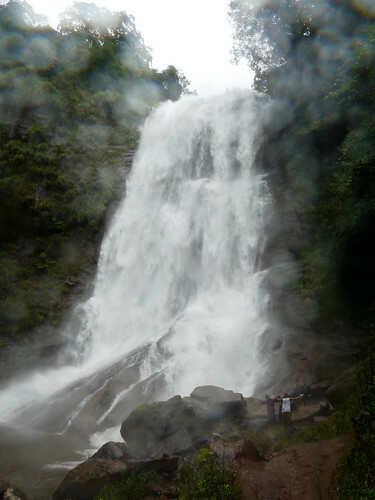 We wanted to visit Hebbe falls on the same day, but the locals told us the road is not good and it is better to go there the next day early in the morning. 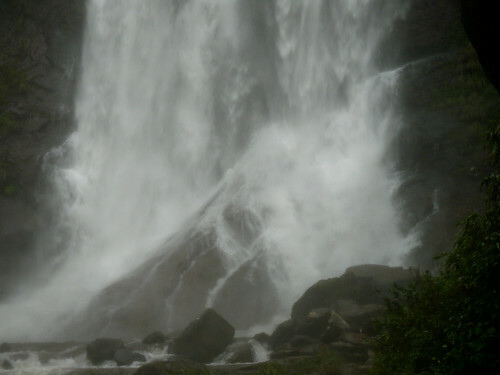 We then visited Kalhatti water falls and went to Bellavara and stayed in a home stay. 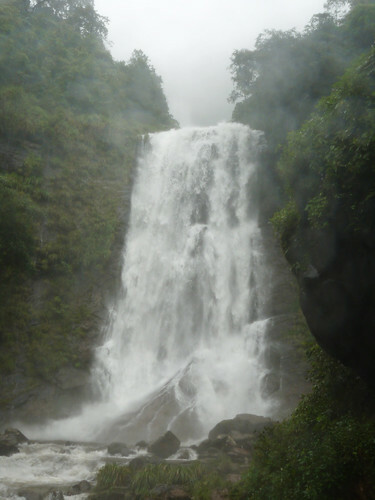 We got up early again, (thanks to Aswin’s alarm) and hired a jeep to go to Hebbe falls. The jeep took us on a sloppy road for around 11 Km and stopped. We had to trek the last few Km of leech infested forest, cross 3 streams to go the Hebbe falls. 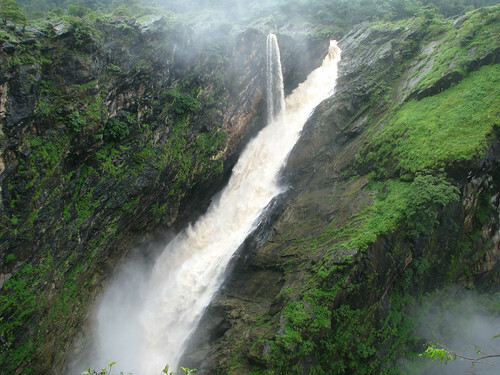 Update: Checkout Aswin’s blog post about our Hebbe falls trip as well. 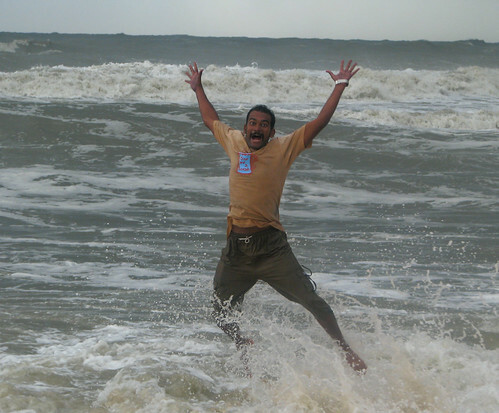 After spending a couple of hours in the falls we came back to our home stay and stated towards Udupi. We wanted to reach Udupi before it gets dark but it started to rain heavily and we had to stay at Kalasa. We started early in the morning (again you know how 😉 ) and drove through the Kudremukh forest area. This drive was one of the awesome drives of my life. We were driving through rain and the road was covered with mist with just a few meters of visibility surrounded by huge treas. On the way I also spotted a tiger club right in the road. From Kudremukh we reached Udupi via Karkala and Manipal. 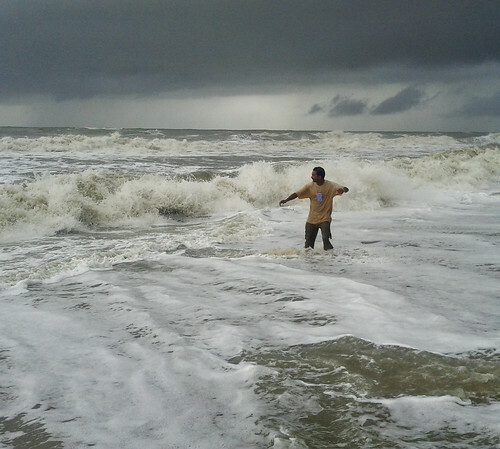 After having lunch we started to Maravanthe Beach. At Maravanthe beach the tide was heavy and we spent a couple of hours playing in the beach like kids 🙂 Check out some of the photos which were taken while we were playing in the beach. It took as close to 3 hours and 15 minutes to cover the 90 Km of bad ghat road in pitch dark with pouring rain. We reached Kargal at around 9:45 PM and took a room and rested. 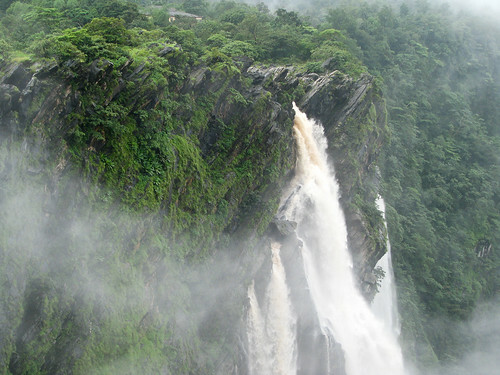 The next day we woke up late, and lazily roamed around Kargal and went to Jog falls after having breakfast. 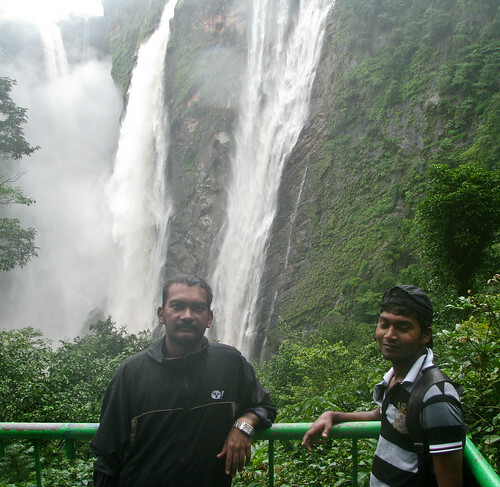 The board on the way to Jog falls claimed it to be “World famous” and when we reached the falls, we felt that it indeed was “World famous”. It was massive and had around 4-5 mini-falls. We had to climb down 1500 steps to get to the place where the water was falling and it was worth it. Once again, the kid inside us came out and we were playing the water. After spending almost the entire day in Jog falls, we went to Sagar and had dinner at a friend’s place. We again woke up lazily on Sunday and from Sagar, went to Shimoga, met another friend and then came to Arasikere. At Arasikere we had lunch and then started racing towards Bangalore. We reached Tumkur at around 5:30 PM and reached Bangalore at around 8 PM. Yep! It was truly one heck of an amazing trip 😀 one of my dream trips actually! Thanks for being on the trip. 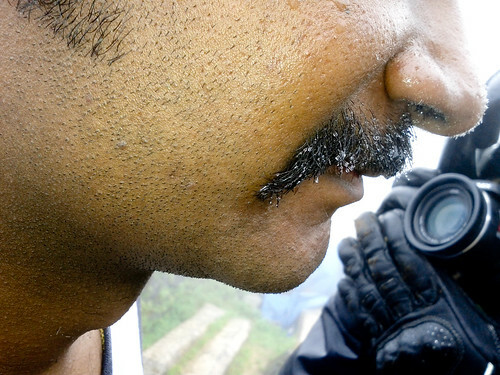 hey sudar by the ways i forgot to give a little intro about me..As u can see am chaya naidu and i met aswin in one of the bangalore ascenders trek. before that even i knew him thru ctc. 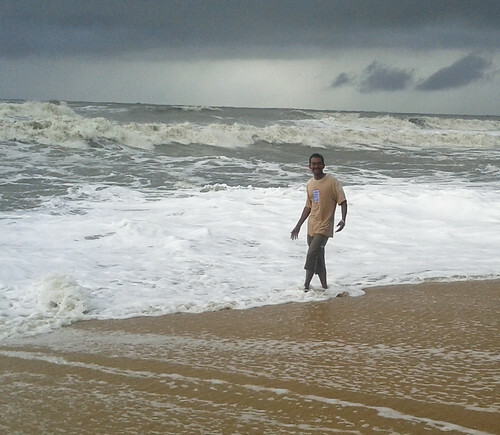 and am such an outgoing person…can go to any length to visit nature in its bounty. 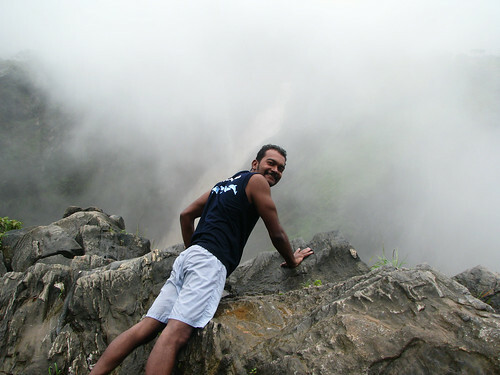 love the adventure to the core…and i dont fear to do anything adventurous on earth…cya.. I understand its an old thread/post. But, I read anyway and oh man, feeling like , I also came with u guys. Excellent photography ! when u say ‘drive’, u mean u guys took own car, or rented cars as u move on? By ‘drive’ I mean driving a motor cycle 🙂 We took our own bikes there. Didn’t rent it. I don’t remember the places where we stayed. We just found those on the way. Western Ghats is a mountain range that runs parallel to the western coast of the Indian peninsula, located entirely in India. It is a UNESCO World Heritage Site and is one of the eight “hottest hot-spots” of biological diversity in the world. And its very nice place to visit with friends and family to have lot of fun and make the every moment very memorable in your life. I totally enjoyed reading this blog, superb! 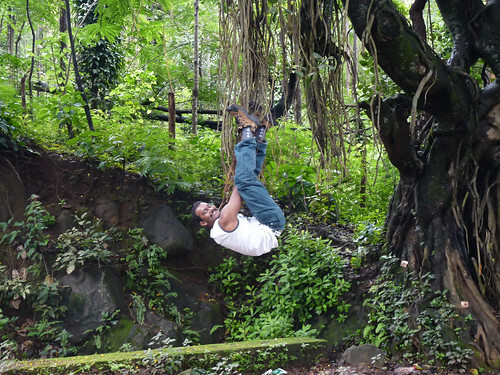 Travel log of my trip to Western Ghats http://t.co/vELyI3vm . 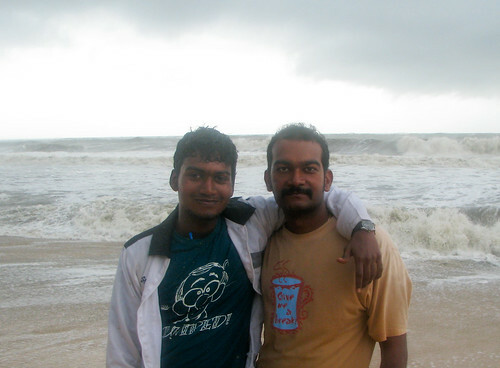 It was one of the amazing trip that I had in recent times. 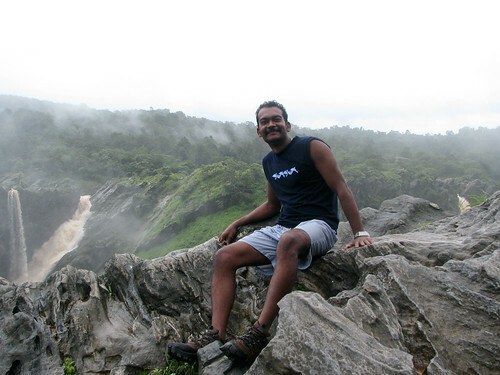 RT @sudarmuthu: Travel log of my trip to Western Ghats http://t.co/vELyI3vm . 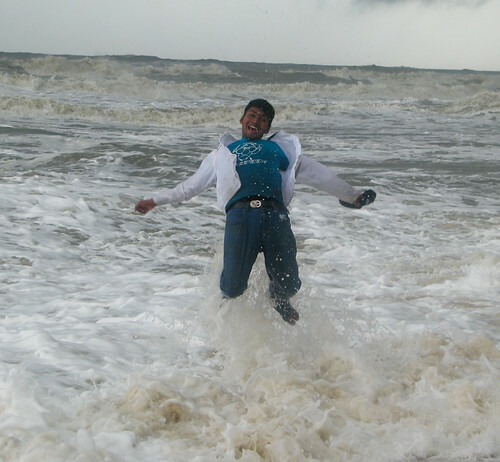 It was one of the amazing trip that I had in recent times.